On 12 June, 2017 we have organized two programs among Refurbishes as a part of campaign against E-waste in Indore City. In this program also we have received support of local NGO, Arunodaya Lok Kalyan Samiti and its Director Shri. Vyas along with his staff. 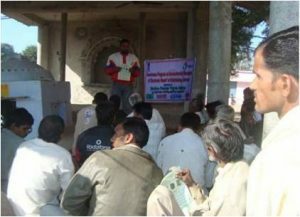 First program was organized from 3.00-4.00 PM at Community Hall, Marymata Chouraha, Indore, in which 33 persons participated. Similarly another program was organized at a Godown at Rajwara from 5.00-6.30 PM. 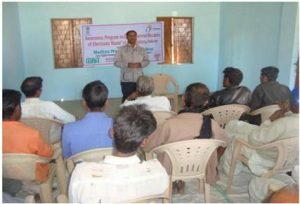 There were 30 refurbishes were attended in this program. We are approached shops and maintenance cetnres of computer and electronic items and invited one or two mechanics from each shops for this program.